Having small children with an interest in being princesses, we have quite a collection of Disney DVDs¹ and quite a few musicals. These get played frequently, get handled pretty roughly and don’t always last as well as they should. For this reason I make a copy of my DVDs - the kids get the copy and the master sits safely in a cupboard. In the view of some organisations this probably constitutes an illegal act but I see it as fair use. It is currently illegal in the United Kingdom for people to “rip” content from a CD or DVD to their personal computers or other devices, though more than half of all British consumers have done so at some point, according to the National Consumer Council. Setting aside the issue of protecting my DVDs from damage I find it ironic that the other driver to making copies of DVDs is the anti-privacy trailers that are frequently present on these DVDs and can’t be skipped through. 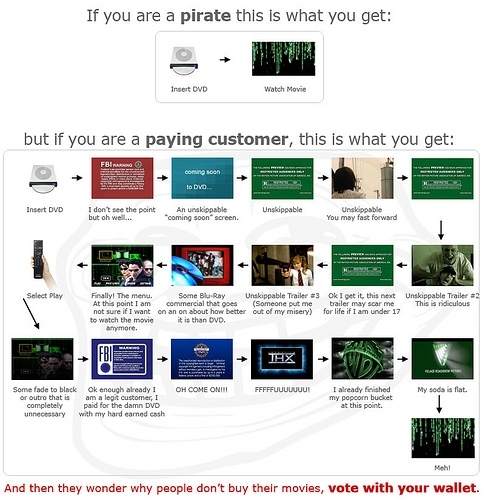 I liked the graphic below that was linked to on Twitter via Scot Hacker. As Scot points out, this fails to show the steps needed to copy a DVD but I would add that it balances out because it also doesn’t show the repeated benefits each time the DVD is watched. Some credit goes to Disney though. Uncomfortable as I am with the marketing of the ‘Disney Princess’ franchise, they do at least allow quick access to the main feature on their DVDs.